Hazel Court Ponds is a 5 lake complex near Cowbridge, which is absolutely stuffed with fish. It is also one of the very few fishing venues in South Wales which can honestly boast that it legally has Catfish, up to the 30lb mark! I have fished there previously with the children’s charity Ty Gwyn; catching small Roach, Rudd and Koi Carp, but that was a few years ago. It was time to pay the venue a visit and see if any of the fish had put on a few pounds (like I have!). Arriving at the venue with my partner, I was told by the owner that the lake I intended to fish was now a feeder pond. 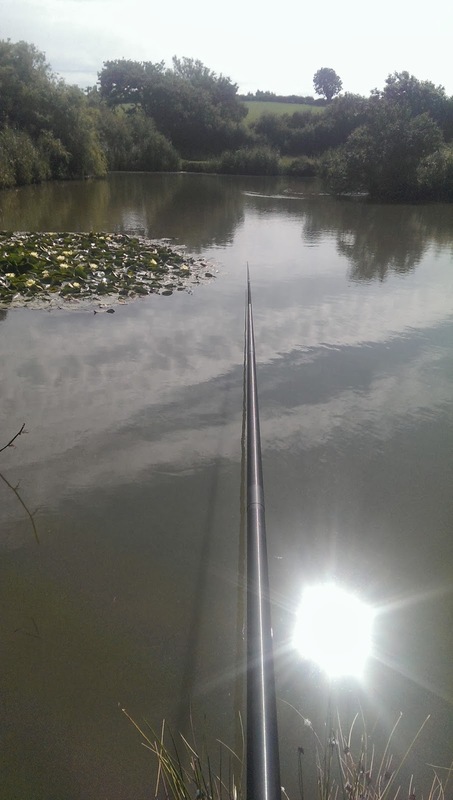 So my initial plan of fishing the most established lake on the venue was out the window. This meant a re-think was required, and I quickly decided to fish what is known as the Reed pond. Picking the peg furthest away from the Car park, I set up my equipment and surveyed my prospective swims. There were 2 margin swims, 2 swims at 7 meters to lilies on both sides and a small section of open water which I could reach beyond with both pole and Waggler. Plumbing up I found out that this section of the lake was incredibly shallow (around 18 inches), but unperturbed I set my rigs accordingly and shipped out. On shipping out I also saw an enormous carp jump clear out the water twice! Here’s hoping it was going to be a good day. 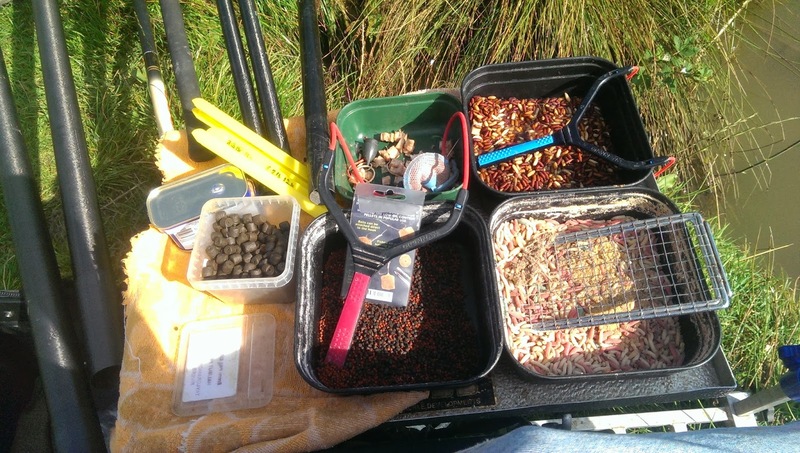 Plenty of bait to temp the fish at Hazel Court! Double Maggot always works well on fisheries like this and 30 seconds after shipping out my float sailed away, and on striking I hit into my first fish of the day. It was a roach of a few ounces. Introducing a few pouches of pellets, along with a hand full of maggots, meant the fish began feeding off the surface. Before long the calm surface of the lake was a hive of activity, with fish greedily gobbling down any loose offerings they could find, from maggots, casters and small floating pellets to an unfortunate wasp I swatted away. Double caster was definitely pulling in the better stamp of fish with Roach and Rudd up around the 1lb mark readily taking them as hookbait. Switching between Pole and Waggler didn’t stop these fish either, they were being caught under the rod tip or right out in open water at 14+ meters. The number of fish in this lake was phenomenal. 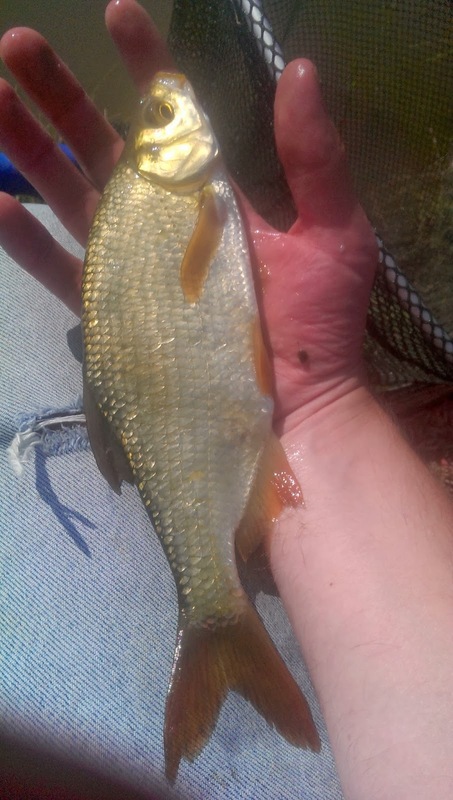 While catching these perfect Roach and Rudd I kept my lily pads swims busy with a mix of Halibut and Krill Pellet feed. Slowly but surely the signs of activity were starting to register with infrequently vegetation movement. It was almost time to go after the bigun’s, which I knew the lake held. Switching back to the pole and using Meat as a hookbait (meat is always a good place to start) I shipped out, carefully placing my rig as close to lilies as I dared (a good run and I might be in trouble). I began to wait. Line bites registered immediately and after a further few minutes my float disappeared. I was expecting a carp, but on this occasion a Rudd had taken a fancy to my hook bait and devoured it! Unbelievably this happened another 5 or 6 times. It was time for a re-think; bigger baits weren’t doing the business either, so I switched to a banded 8mm pellet. To cut a long story short I didn’t get a touch! Incredibly these stock pond carp didn’t like meat or pellets! Well, they didn’t like them today anyway. Switching back to meat, or corn or indeed any of my other hook baits resulted in instant fish, just not the fish I was aiming for. 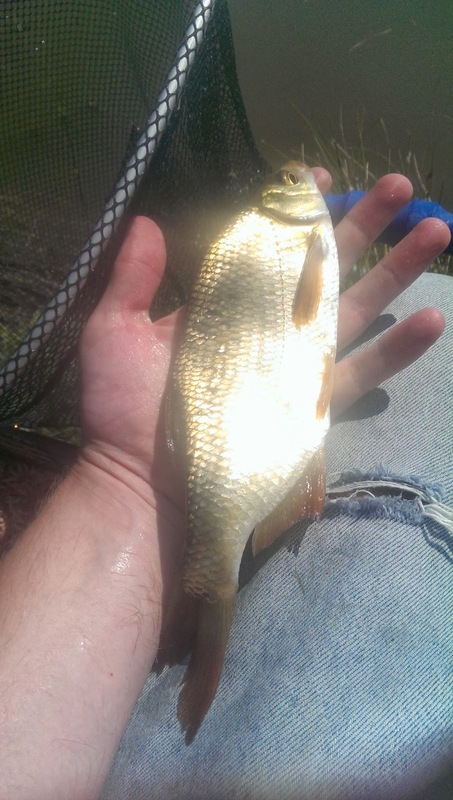 After a good hour of waiting for that big fish (and successfully missing 2 solids bites because I was focusing on a kamikaze wasp), I switched back to fish meat to try and catch some of specimen Roach which I had been plagued with either. To add insult to injury, looking into the lilies to my right, there were carp lazily taking bits off the surface! Today happened to be one of the only days I didn’t have bread or dog biscuits in the car. Sadly I had no fake bread either. Manoeuvring a banded pellet to the fishes’ location only served to spook the fish, and I was left having to fish for Roach and Rudd for the last hour of the session. I do really like fishing Hazel Court but I left feeling quite deflated. The lake is stuffed full of fish, and not catching the species that I had aimed for was a bit of a kick in the nads! Perhaps I was on the wrong peg? 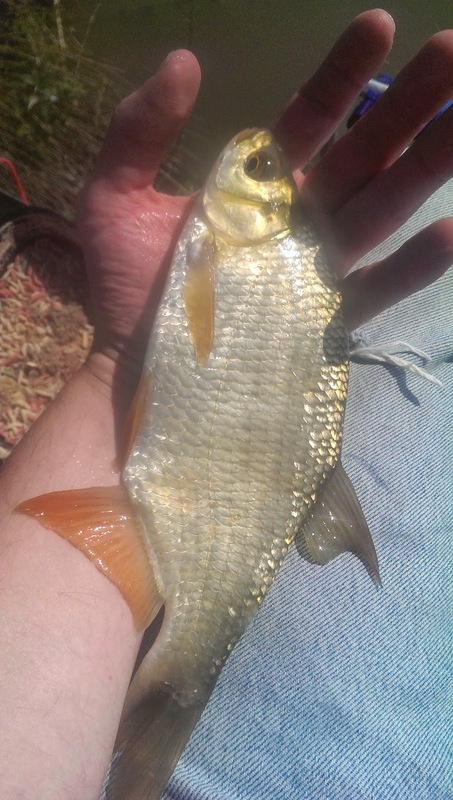 Perhaps the carp in the lake just weren’t readily feeding; one thing is for certain I must try harder! I will certainly be returning to Hazel Court for a Carpy re-match, and quite soon. In the mean time if you want a solid afternoon’s sport of good quality silver fish then look no further. With great access, a small on site shop and 4 excellently laid out lakes to choose from, there are hours if not days of fun to be had at this fishery.